Last year in the demo garden I decided to grow cutting celery, also known as leaf celery (also – correct me if I’m wrong – Chinese celery seems to be the same thing). This type of celery is grown for its flavorful leaves rather than for thick stalks. It was one of our most successful crops, and we had a lot of it! It also proved to be very cold-tolerant, and survived the non-winter without batting a leaf. We have removed it to make way for other crops, but at home I still have several plants going. Soon, however, I suspect it will bolt into flower, so I’ve been thinking about ways to use it. Last fall I made a celery soup that was okay – it’s very hard to blend the tough leaves finely enough for a smooth bite. This spring I thought I’d try celery pesto. Celery pesto, you say. Well, I’d never had any, but it sounded like an idea that would work, and a quick web search proved me right: dozens of recipes. I checked out a few and then came up with my own, as usual based on not going shopping for ingredients. If you don’t have leaf celery, you could make this with regular stalk celery as long as it has plenty of leaves. Don’t use the thick stalks, but the thinner parts close to the leaves would work. I used the entire stalks of my leaf celery plants; they only get about a quarter inch thick and are hollow. Put all the ingredients in a food processor and run it for 10-20 seconds, or till it looks like pesto to you. *The better quality oil, the nicer the pesto. If you like your pesto unctuous, add more oil; if you prefer it on the dry side, use less. This is the Goldilocks measure for me. I didn’t add any salt, and I don’t think this recipe needs it, but if you disagree on tasting, toss a bit in and blend more. Enjoy! What a great idea. Each year I think about planting celery, but I use it very rarely – for occasional soups and stews and not much else – that I've never tried. I might be motivated if I consider that at times when I have more on hand than I need, making pesto and freezing it could stretch my dollar. Thanks for participating in Post Produce! 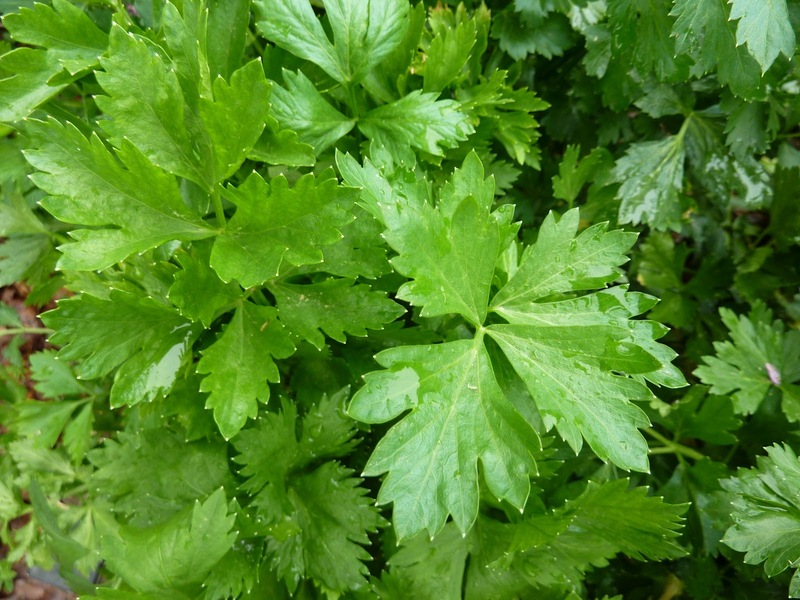 I recommend planting cutting celery over regular stem celery – and treat it like an herb. A few plants will do. Unless you really like snacking on celery, there always seems to be too much.